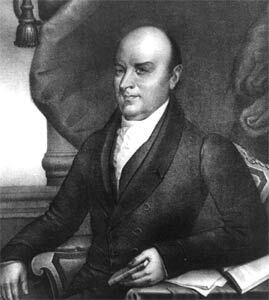 John Quincy Adams, as a Congressman from Massachusetts. Lithograph published by G. Endicott between 1834 and 1840. Library of Congress, Prints and Photographs Division, LC-USZ62-94849. "By war the slave may emancipate himself; it may become necessary for the master to recognize his emancipation by a treaty of peace." The ideas of Adams found their first practical application in 1838 with Jesup's offer of freedom. The Congressman died before he could see their second application in 1861. That was when Adams' former protégé, Senator Charles Sumner, set to work persuading President Abraham Lincoln that under the war powers he had a constitutional right to emancipate southern slaves. Lincoln and Sumner traced their thinking back to Adams, who, in turn, based his ideas on the actions of the Black Seminoles. One can therefore trace a direct line from the Black Seminole rebellion to one of the most momentous events in American history, the emancipation of three million southern slaves in 1863. In more ways than one the Black Seminoles were pioneers on the American frontier. Jump ahead to the segment in section four, "The War Power," for more details on how the Black Seminoles and "Jesup's Proclamation" influenced Abraham Lincoln's decision to free the southern slaves in 1863.